I'll admit that I'm a sucker for books with an alternative artistic design. 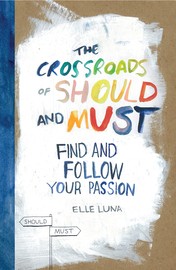 I'm also unashamedly fond of self-help books, especially those about creativity, so The Crossroads of Should and Must by Elle Luna practically jumped off the shelf and into my hands. Luna wrote an online manifesto on the topic of doing what you feel you should vs. finding and doing the thing that you're most passionate about, and that manifesto exploded in popularity and obviously hit a nerve in many. Deciding that the topic could be expanded, she then created The Crossroads of Should and Must to act as a guide for students, creatives, and career-changers who feel that their current path in life is one established by societal "shoulds" instead of by their own personal desires. Basically, Luna holds your hand and shows you how to find your One True Calling. It's tough to review a self-help book because every reader will take away something different, even if that something is nothing at all, but I firmly believe that there is a pearl to be found in this book for every person who gives it a chance. I expected to discover that my passion was a bit farther away from what it is I do now, but after closer inspection using the recommended methods in The Crossroads of Should and Must, I found that I'm doing almost what I want with my life and work. A few of Elle Luna's suggestions have even given me ideas on how I can tweak the path that I'm currently on and steer it more towards one that's 100% fulfilling. I loved that the author's voice encourages exploration and that it comes across as the voice of an equal instead of that of a condescending or over-authoritative writer who dishes out advice like theirs is the only proper solution to your problem. The loose, handwritten pages and vivid artwork are refreshing and inspiring when set against passages of typed text, and the combination strikes just the right balance between casual and formal self-help literature. In all, I feel that the book serves as a useful tool for self-analysis and self-discovery that anyone questioning their past, present, or future career decisions can benefit from.